The Pagan community is a network of interrelated groups, organizations, and individuals interacting on local, national, and international scales. Pagan groups may be called circles, groves, covens, tribes, nests, or by other names. There is no central Pagan authority. The lack of central organization and the stigma attached to self-identifying as Pagan makes estimating the number of Pagans difficult. The best estimates are that there are approximately 1 million Pagans in the United States and over 100,000 in the United Kingdom. This is less than one half of one percent (0.5%) of the population in the U.S. 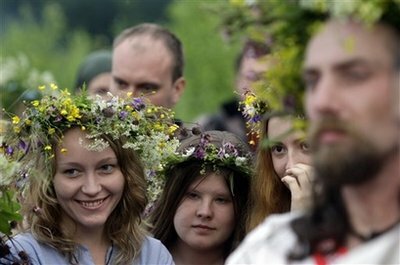 In spite of recent growth, Paganism remains a small minority religion, and will likely continue to be so for the foreseeable future. Finding Pagans can be difficult. There are two principal reason for this. First, according to a Pagan census, the majority of Pagans are solitary (79% in 2010). 75% of Pagans meet with other Pagans at least annually, but only 25% do so weekly. Many Pagans’ primary form of interaction with other Pagans is on the Internet. A second reason for the relative invisibility of Pagans is the lack of physical structures representing Paganism. There are few Pagan churches, which, in addition to being gathering places, might serve as symbolic centers for the general community. Pagans do hold annual festivals and conventions, but these events cannot serve as permanent symbols, because the signs of their presence disappear when the event is over. There are some Pagan temples and sanctuaries, like Circle Sanctuary, but they are few and far between. In spite of this, Pagans, more than those belonging to monotheistic religions, tend to emphasize their individual distinctiveness over their similarities. This inhibits the creation of community around a shared identity. Many Pagans actively resist the routinization of Paganism, the formation of Pagan institutions, so as to preserve its counter-cultural nature. In a 1998 survey conducted at a Vermont WitchCamp, respondents were asked to specify their religious identity. They were allowed to indicate more than one identity and were also allowed to specify an “other”. About half labeled themselves as “Witch” (58%), the same amount identified as “Pagan” (58%), and a little less than half identified as “Wiccan” (46%). Another 27% identified as “Neo-Pagan”. A full third (34%) indicated they “disliked labels”. The respondents selected an average of 4.5 identities each. And when asked to select their primary religious identity, there were 26 different responses out of 67 completed surveys! The diversity of responses was remarkable given that the survey was conducted at an event organized by one of the oldest Pagan traditions, Reclaiming Witchcraft. In spite of this, only 33% identified as “Reclaiming”. The diversity would likely be even greater at a more general Pagan event like the many Pagan Pride Day events around the country or Pantheacon, the largest indoor Pagan convention. Another reason building community among Pagans is especially difficult is that Pagans tend to be iconoclasts and antinomians. Paganism is a counter-cultural movement. While Pagans may seek respect from the dominant culture, many resist “respectability”, which they perceive as compromising those values and practices which are what sets them apart from our predominantly alienating and exploitative dominant culture. In spite of all this, there are Pagan institutions. Some Pagan traditions are established as legally-recognized churches with tax-exempt status, like the Church of All Worlds and the Aquarian Tabernacle Church. There are other large Pagan organizations, like Covenant of the Goddess in the U.S. and the Pagan Federation in the U.K. There is a Pagan newswire service and websites like The Wild Hunt which gather news of interest to Pagans. Pagans serve in the leadership of various ecumenical and inter-faith groups, like the Council for a Parliament of the World’s Religions. Pagan studies is growing as an academic discipline. There is an academic journal of Pagan Studies called Pomegranate. And there is even a Pagan seminary, Cherry Hill Seminary. Pagans in the military have become more organized. Pagan advocacy groups, like the Lady Liberty League, work to protect the rights of Pagans in the workplace, in prisons, and in the community in general. And there are many online forums where Pagans can share ideas and organize, like Witchvox and the Pagan Portal at Patheos.com. There are also Pagan publications like Witches & Pagans and the Green Egg. The past few days, the main PNC website has been giving me a “Fatal Error” message. While my memory refuses to give me their name, I believe that a Trad in Fort Hood, Texas (outside the military base by the same name) sponsors a great many of the Distinguished Faith-Group Leaders of a Pagan persuasion on many military posts around the world. The group “MilPagan” has been gone for years now. If I remember, the ATC once had an internal seminary. Not having ever done (nor do I intend to begin to) facebook, myspace, twitter, or AO-Hell, I have no idea what Witchvox does these days. Their original site seems to be diminishing in users every day.